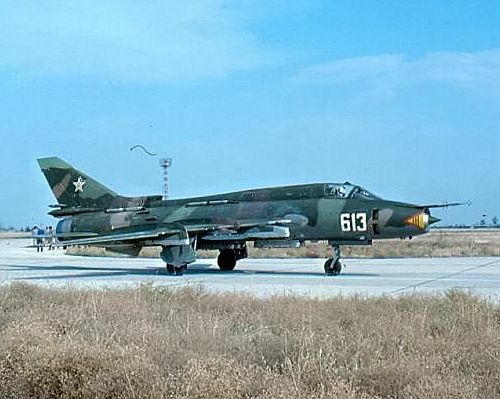 Between 1984 and 1988 the Bulgarian 26th Reconnaissance Air Regiment's 2nd Squadron (flown with MiG-17 Fresco-A) converted to the Su-22M-4 Fitter-K and Su-22UM-3K for use as a tactical reconnaissance platform in photo reconnaissance and ELINT tasks. The last MiG-17 Fresco left the air force's inventory in 1989, At that time the 26th Reconnaissance Air Regiment’s 2nd squadron was an elite air unit of the Warsaw Pact, comprising 22 pilots 1st class being superbly trained in airborne reconnaissance, guided weapons ground attack and even Air-to-Air combat, utilizing the R-60 Air to Air Missile, with about 120-130 flight hours yearly. Until the Treaty for Conventional Forces in Europe forced the Bulgarian Air Force to remove that kind of specialized equipment nuclear strikes could also have been carried.